How many calories are in a serving of Success® Rice? 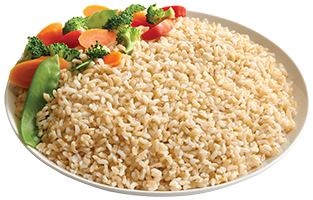 A serving of Success® Rice is about 1 cup cooked rice - the calories for Success® White Rice is 190 and 150 for Success® Brown Rice. How many calories are in one bag of Success® Rice? A regular size bag of Success® White Rice (3.5 oz.) has 380 calories/bag; a large size bag of Success® White Rice (5.33 oz.) has 570 calories/bag; one bag of Success® Brown has 300 calories. How much cooked rice does one bag of Success® Rice make? A regular size bag of Success® White Rice or Brown Rice (3.5 oz.) makes 2 cups of cooked rice. 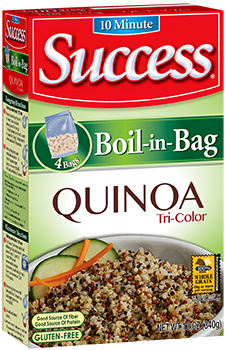 A larger size bag of Success® Rice (5.33 oz.) in the 32 oz. carton makes 3 cups of cooked rice. What is a serving size of Success® Rice? According to the United States Department of Agriculture (USDA), the serving size for rice is ½ cup of uncooked instant rice. This makes approximately 1 cup cooked. Why do you enrich Success® Rice? Enrichment found in Success® Rice is a collection of vitamins and minerals consisting of thiamin, niacin, iron and folic acid. Due to processing conditions, rice loses a certain amount of its nutrients. Key nutrients are added to the rice prior to packaging (thus enriching the rice). This is prescribed by the USDA.